Hi Brian and welcome to the forum. Your first query is a tricky one. I can't find anything outwith the normal annual inter-league fixtures. There is nothing in the fixture lists for either 1951-52 or 1952-53 and no mention of any 'B' inter-league games in Bob Crampsey's centenary history of the SFL. The 'normal' games v the Irish League for the seasons covering 1952 were on 26/9/51 at Ibrox and 3/9/52 at Windsor Park. Full details of these matches are available if that's what you are looking for but I'm sorry I don't know anything about a 'B' game. Ah, then it may well have been a 'B' Division team rather than a Scottish League 'B' as such. Killie were in the 'B' Division in those days and were unlikely to have many players picked at representative level. Ralph Collins spent ten years at Rugby Park, playing in 330 first class matches, skippered the team in the 1957 Scottish Cup Final, also played in the 1952-53 League Cup final and won promotion in 1954 but to the best of my knowledge wasn't selected for a full appearance by the Scottish League. My thanks to Killie programme Editor Richard Cairns who came up with the goods. 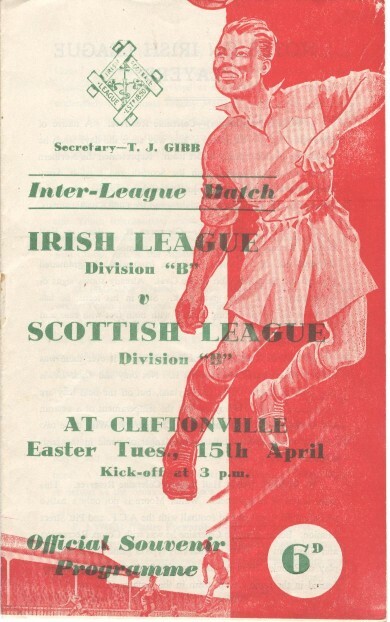 It was, as I suspected, a 'B' Division team which met their Northern Irish counterparts on April 15th 1952 at Cliftonville. Richard has kindly supplied us with a programme cover but there are no other details of the game. Anyone with result, full line-ups, scorers etc, please post here. It was a 0-0 draw.